Our Tinabless Fruit Teething Toys are very convenient and practical for both babies and mothers. Children undergo a natural teething process as they develop their first milk teeth, which is a necessary step to ensure they can eat more solid foods.The pliable beads and bumps design will help them relieve gum soreness. They are easy to clean,just need wash it with soap and warm water.They can be placed in the freezer and dishwasher.They can be placed in the freezer to add a cooling effect,also can be placed in the dishwasher to wash it. It has 4 holes at the base that you can let the pacifier clip through it to attach to your baby so he or she will not lose it and can easily reach it. There's different shaped bumps under the base, baby can also chew here to relieve gum soreness. Perfect Baby Shower Gift for both boys and girls! Warranty: If there have any questions about the Tinabless' Baby products, please feel free to contact us. YOUR BABY'S SAFETY IS OUR PRIORITY - Since these products come into direct contact with your baby's mouth, our Tinabless teething toys are made of 100% food-grade silicone, free of: BPA, Lead , Petroleum, Latex, phthalates. 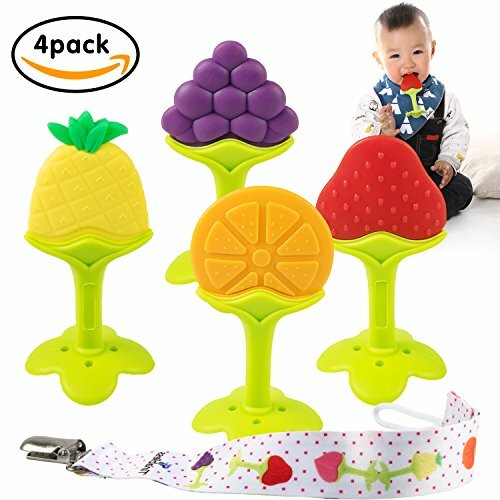 These fruit teether toys are FDA approved and 100% safe for your infant! RELIEVE YOUR CHILD'S TEETHING DISCOMFORT -These infant toys have the grooves and bumps to gently rub a baby's gums in order to soothe and relieve the pains your child has to suffer through while teething. The soft silicone material will not harm the child's mouth area. FIT FOR BABY'S MOUTH AND LITTLE HANDS - Very light and small enough that baby could grip the teething ring well. Designed to fit baby's mouth comfortably without posing a choking hazard. Exercise your baby's coordination ability of hands, eyes, brain. A FREE PACIFIER CLIP - As a bonus, a durable childproof clip holder will come with baby teething toys. No more losing the precious teethers or having to pick them up from the dirt anymore. Our plastic clip is safe, NO rust, NO chips, NO baby skin scratches, NO clothes damaged. 100% MONEY BACK GUARANTEE - We only care about your 100% satisfaction. If you feel that these massaging teethers didn't live up to your expectations, let us know and we promise a 100% money back guarantee. If you have any questions about this product by Tinabless, contact us by completing and submitting the form below. If you are looking for a specif part number, please include it with your message.